In the main screen you can customize the Settings and turn the SFX and Music on or off, then choose your preferred Language. You also get a Daily Reward and some Change Log notifications before you’re taken to the MiniGiants.io menu. Enter your Name, then choose a Character (Barbarian, Tank, Fairy, Amazon, Necromancer, Mage, Cleric or Beast). You can click on the Armor icon on the left part to access purchased Armor, Weapons, Gloves and Accessories and equip them on your avatar. When you’re set, click on Play to enter the battlefield. Playing MiniGiants.io is easy. Use the mouse cursor to Move, then click the left mouse button to Attack and the right mouse button to Speed Up. There are shiny Rocks littering the landscape; collect them and you gain XP for leveling up. Killing an opponent drops a Chest, which gives you Gold for leveling and upgrading equipment. Climb up the ranks to get #1 on the Leaderboards for bragging rights. In MiniGiants.io, the Health Bar and Level will be displayed just right below a player’s name. This gives you an indication of whether you can actually kill them and when to steer clear of them. Attack lower level players as they have lower HP and damage; when you see a high-level player with one bar of HP, go ahead and you just might get lucky. Kills reward you with XP which levels up your account. The higher your level, the better your Warrior and the more competitive you’ll be. Beginners should focus on collecting shiny Rocks to level up and become bigger. Don’t fight battles with higher level players just yet; roam at the edge and get ready to use your Speed Boost to get away. From time and again you’ll see Chests of varying quality- Wooden are common and Gold are rare, while Crystal and Magic give the most chance for epic-level equipment. Speed boosts are useful in a number of scenarios, so don’t waste them needlessly. Keep an eye on the Speed bar and ease off on the gas if you’ve burned through the halfway mark, except in emergencies. Speed boosts can be used to escape a stronger opponent, grab a Chest or collect large shiny Rocks for faster leveling. 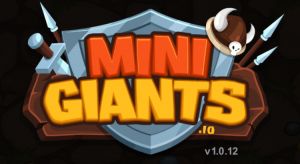 MiniGiants.io offers cool rewards just by interacting with them on various social media platforms. You can Like on Facebook, Follow on Twitter, Subscribe on YouTube and Follow on Instagram to get gold Chests and a chance to acquire epic loot. If you have an existing account then it should only takes a few minutes to get the rewards.